Due to the early snowfall in the winter of 2018, the Village of Homer DPW will be doing ONE and only ONE leaf pick up for Village residents. Leaf pick up will be on Wednesday, April 17, 2019. Any leaves collected after this date, are the responsibility of the property owner. A leaf disposal site is available behind the cemetery for all Village of Homer residents. 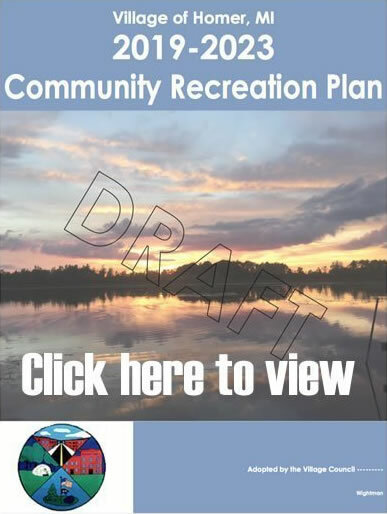 This is to remind everyone that the Homer Village Master Plan is available for review and input on the Village’s website (www.homermichigan.org) or hard copy in the office. This is your plan that will direct how Homer Village will move forward. Please use this time to review the plan and submit comments to the Village before the April 11 Planning Commission’s Public Hearing. 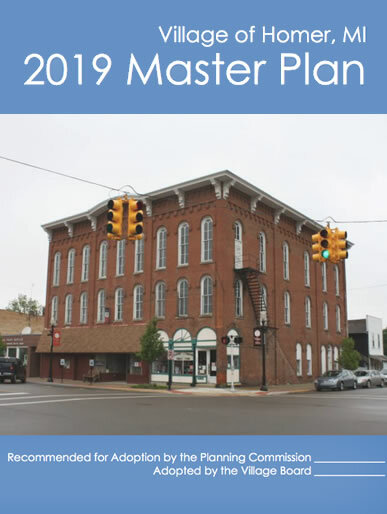 If approved at that meeting the Master Plan will be submitted to the Village Council for implementation at the May 6, 2019 meeting. Any questions, please call the Homer Village office at 517-568-4321. No person shall park a vehicle on any of the public streets, alleys, and/or easements of the Village between the hours of 2:00 a.m. and 6:00 a.m. at any time, unless otherwise posted. For those residents that have issues with pipes freezing, keep a pencil lead stream of water running in your faucet to keep the water flowing through your service lines so your pipes do not freeze. To assist the Village of Homer’s DPW in keeping our streets clean, please note the following Parking Ordinance stating that there is no parking between 2:00 a.m. and 6:00 a.m. all year. The Village of Homer was incorporated in 1871, but its rich history dates back to the hardy pioneers who settled here. Powel Grover, William Wintersteen and two brothers, Richard and Henry McMurtrie, were the first pioneers to come to Homer. It was mid-April 1832, and they walked all the way from Luzerne County, Pennsylvania to settle on land three miles east of the area that later became the Village of Homer. Milton Barney arrived from Lyons, New York later in 1832, purchased land along the Kalamazoo River, and the next year brought his family to the area where he had built a log house, a store and a small sawmill using waterpower from the river. He built the first hotel, served as the first postmaster, and started the state? first wildcat bank. This cluster of buildings was the beginning of Barneyville, the village? original name that was changed to Homer in 1834 because James Hopkins and others from Homer, Cortland County, New York wanted the area named after their previous home. From the beginning, Homer has had a proud history of innovation in agriculture, business and industry, education and community development. Its services and infrastructure have evolved to meet the needs of area residents now and in the future. The sign on the village water tower proclaiming Homer Is Home reflects the spirit and commitment of the community.